Your flight must arrive by or before: 23:59 on Day 1. Your flight must depart no earlier than: 00:00 on Day 6. Wake up surrounded by breathtaking landscapes and continue hiking along the W Trek, crossing Paine River and passing through grassy fields. Stop at Lake Nordenskjöld and snap a photo of the mountains reflecting in the lake before reaching the camp. Take in some amazing scenery on this stretch – light blue lakes contrast beautifully against the deep green forest. Test your endurance on a couple of uphill sections, but mainly enjoy a straightforward hiking day. Head to the spectacular campsite for the night near Cuernos Camp. 5 breakfasts, 4 lunches, 3 dinners. Torres del Paine NP camping excursion with porters (3 nts). W Trek. All transport between destinations and to/from included activities. Trek the spectacular W Trek, snap a photo of the famous three peaks of Torres, marvel at the lakes and glaciers en route. Please note that if you have booked the "My Own Room" option for this tour, you will receive your own single accommodation for all night stops, with the following exceptions: NIghts 2-4: only the nights in Puerto Natales will be in a single room. A taxi from Punta Arenas is approximately 115,000 CLP / 175 USD (3 hours travel time). There are also public transport options. Bus Sur has 7 buses from the airport per day and travel time is 3.5 hours. Bus tickets cost about 7000 CLP/ 11 USD per person and operate between 7am and 7pm, some days there is a later bus at 9pm as well. (http://bussur.com/?lang=en). 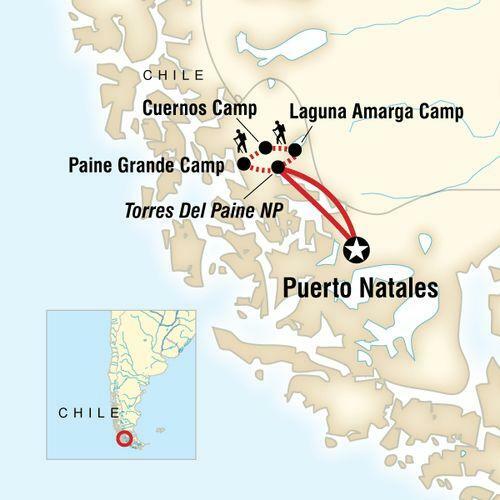 Although the tour finishes in Puerto Natales, you might find more convenient international flight options from Punta Arenas (Chile) or El Calafate (Argentina). If you are flying out of Punta Arenas at the end of your trip, your CEO can help you with booking transport from Puerto Natales back to Punta Arenas. A taxi should cost approximately 115,000 CLP / 175 USD (3 hours travel time). There are also public transport options. Bus Sur has 7 buses per day and travel time is 3.5 hours. Bus tickets cost about 7000 CLP/ 11 USD per person and operate between 7am and 7pm. (http://bussur.com/?lang=en). Camping equipment for the "W" trek is provided and included in the cost of your trip. A sleeping bag and mat are also provided. You may leave the bulk of your gear stored in Puerto Natales. While hiking you will only need to carry your daypack with supplies for the duration of each day. Visa requirements, or see your travel agent. IT'S YOUR RESPONSIBILITY TO HAVE THE CORRECT TRAVEL DOCUMENTATION.